The Library manages the University's print service. We have printers across campus. Our printers can print in black and white and colour, photocopy and scan. They are fitted with adjustable control panels and a screen enlargement option. Visit the University of Salford web printing portal and enter your network username and password. Click Choose File to select the file you want to print, click Open to confirm this and then click Next. Select Colour or Black and White to open up further printing options. When you have selected your required options click either the Salford Print Black and White or Salford Print Colour buttons to send the file to the printer. Open the document you wish to print and click File then Print. 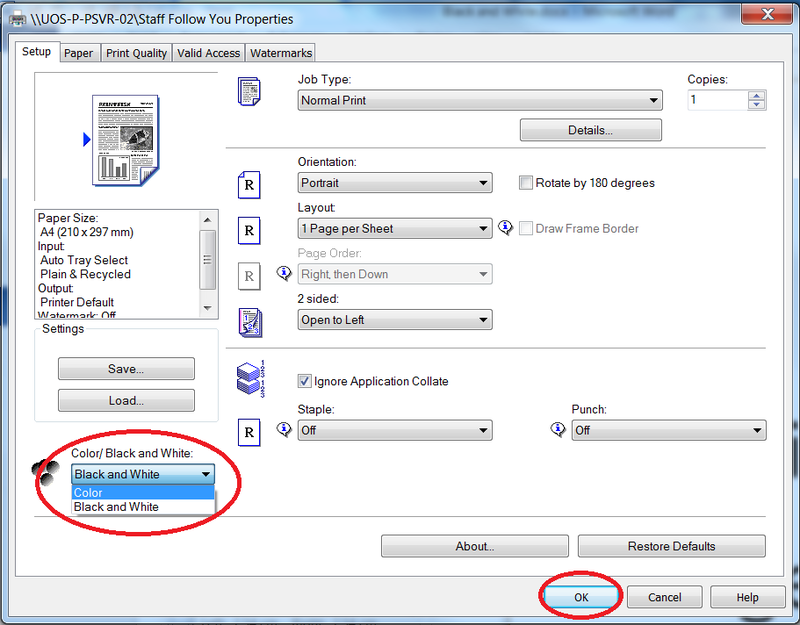 Select Student Follow You from the list of printer options. Then Print. Scan your card at the printer, select the Print option, choose the document that you want to print and press 'Print'. From the menu bar at top of the screen select 'File' and 'Print' (if the menu is not visible, hover your mouse at the top of the screen until it appears). Click 'Print' to send the job to the printers. Click to accept the cost of the job. Log into any printer on campus to retrieve your job. You need to download the EveryonePrint app from your phone's app store. Click Test connection then click Save. Once this is done your device should remember it for future use. Once EveryonePrint is set up you can log in using your University of Salford username and password. We have produced a guide that has more information on using EveryonePrint to print from your mobile phone. You can pay by visiting Printer payment or by selecting the 'Credit Printing Account' desktop icon on University PCs. Self-service print credit kiosks are located at Clifford Whitworth and Allerton Learning Space. Students at MediaCity will need to pay by card. If you have any issues with this, please speak to staff at the Enquiry Desk. You need your ID Card to put cash credits on your print account. If your ID Card does not work you can type in your Printing PIN (Personal Identification Number) at the kiosk instead. The self-service kiosks do not give change and we cannot change money for you to use. You can check your print account balance at any time by visiting a kiosk or the Credit Printing Account desktop icon. Please note: Unused printing credit is not refundable. The cost depends on the size of paper and type of print job. See the table below for details. 1. Where can I print? There are printers available on each floor in Clifford Whitworth in the printing hubs, three in Allerton Learning Space and two at MediaCityUK. This list is made up of printers that are specifically dedicated for student use. There are other printers on campus that students may use. You can use your printing PIN number to log in without your ID card. When at the printing account portal - Log in with your University username and password and click the User Dashboard option. Your printing PIN number will be in one of the boxes near the top of the screen. Log in at https://printingaccount.salford.ac.uk using your University username and password. Click the User Dashboard option and then select Reports. Select User Activity - last 30 days and then View selected report. Please ask at a library enquiry desk if you require access to your printing history beyond the last 30 days. Requests for a printing or photocopying refund are available from a library enquiry desk during staffed hours or via our online form. This form is for printing/photocopying refunds only. You must complete all the required fields when applying for a refund. You will be notified by email to your University of Salford email account when the form is processed; this is normally within one working day between Monday and Friday. If the refund request is due to the document printing incorrectly, please submit the output (i.e. what the printer has produced) to a member of staff at a library Enquiry Desk. This will assist your claim. To query the progress of your refund claim, please email library@salford.ac.uk quoting your network login username and the date on which you applied for the refund. The Library will not provide cash refunds for printing. The Library does not refund any unused printing credit. The Ricoh Print Centre brings professional print and document services to your doorstep. Based onsite, here at the University of Salford, we offer you a consultative service that provides speedy turnaround times and high quality print. The Ricoh Print Centre is in Room 100 of Maxwell Building - accessed via ‘the well’. From outside Maxwell Reception turn right under the bridge and walk down the ramp to the doors marked Reprographics. The Print Room is at the end of the corridor on the left. The Ricoh Print Centre is open all year round except for weekends, bank holidays and the Christmas closure. Opening hours are Monday to Friday, 8am until 4pm. The latest time they will accept a job to print/bind is 3:30pm, however, it may not be possible to complete large print jobs by 4pm on the same day. Visit us or contact us to see how we can best help you! Students may use the services of the Ricoh Print Centre. The standard turnaround time for the Ricoh Print Centre is two days. This may be extended during busy periods such as January and September. The Ricoh Print Centre can usually be flexible according to your requirements and will try and meet your expectations whatever the deadline. Please contact the Ricoh Print Centre to see how they can assist. 1. Choose File, then Print. 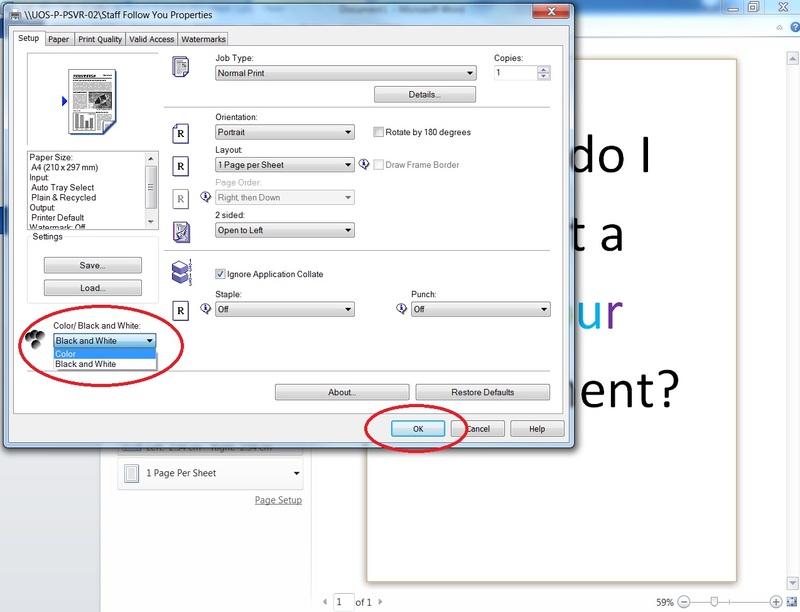 Click on Printer Properties in the print preview and a new window will appear. Change the drop down box in the bottom left-hand corner from Black and White to Colour. Click OK and continue printing as normal. 2. I'm a new student - why can't I log in to the printers? Have you activated your printing account? If not, send a document to the Student Follow You print option from a University PC. Printing the document is not necessary - simply sending it to print will activate your printing account on the system meaning you can use your student ID card to log into the printers. As a new student, you will have £2 free print credit. 1. Choose File, then Print. 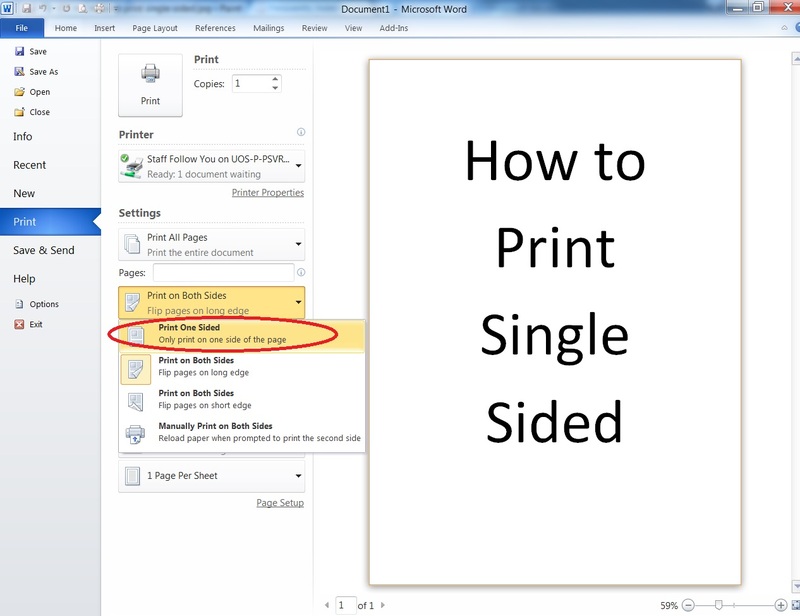 Click Print on both sides in the print preview and a new window will appear. Four options will appear, select Print One Sided then continue printing as normal. 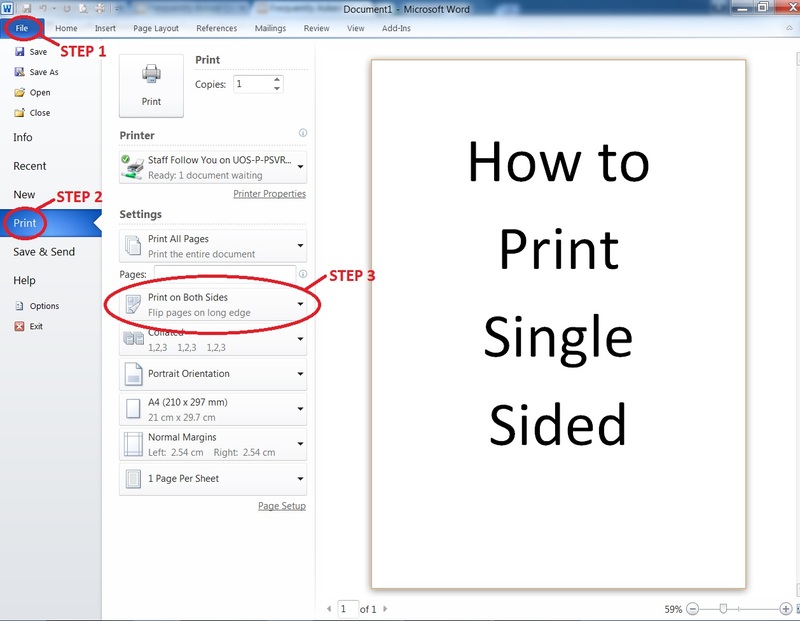 The settings will revert to double-sided automatically, so you will need to repeat this process with every document you want to print single-sided. 4. 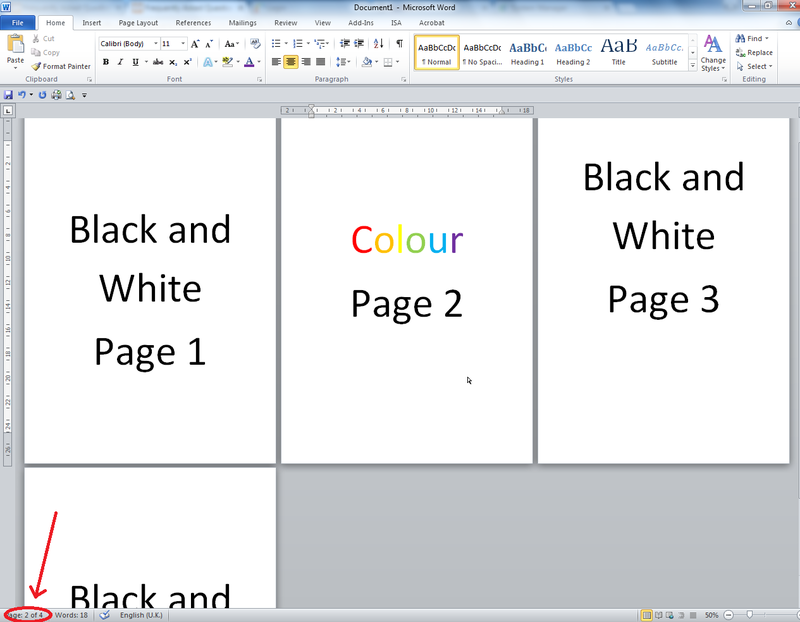 My document contains black and white and colour pages - will I be charged for colour for every page? When you select colour print you will be charged for colour printing for each page of your document regardless of whether or not every page uses colour. 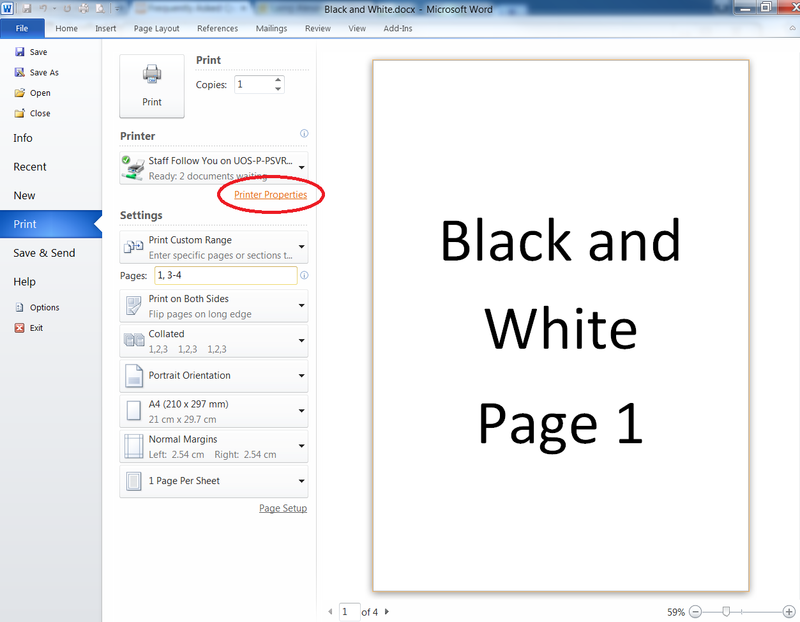 Avoid being charged for colour for any black and white pages in your document by sending them separately. Click your cursor on a colour page and then check the bottom left-hand corner to find out the page number. In the example below you can see that the colour page is page 2 of 4. 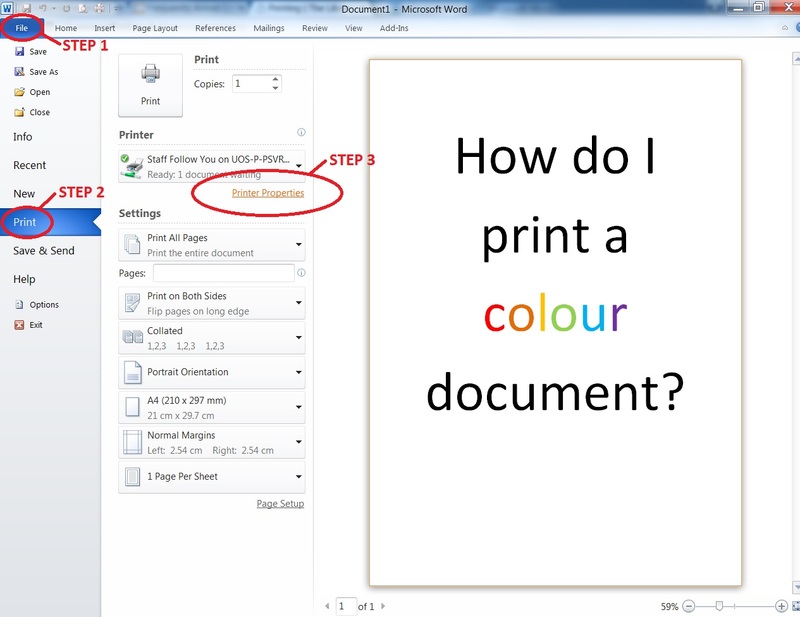 Make a note of which pages you need to print in colour. If you want to print a series of pages, for example every page between page 4 and page 10, you can write this as '4-10'. In the example below you can see that we are going to print pages 1, 3-4. Click print. Only the pages you have entered will be printed. 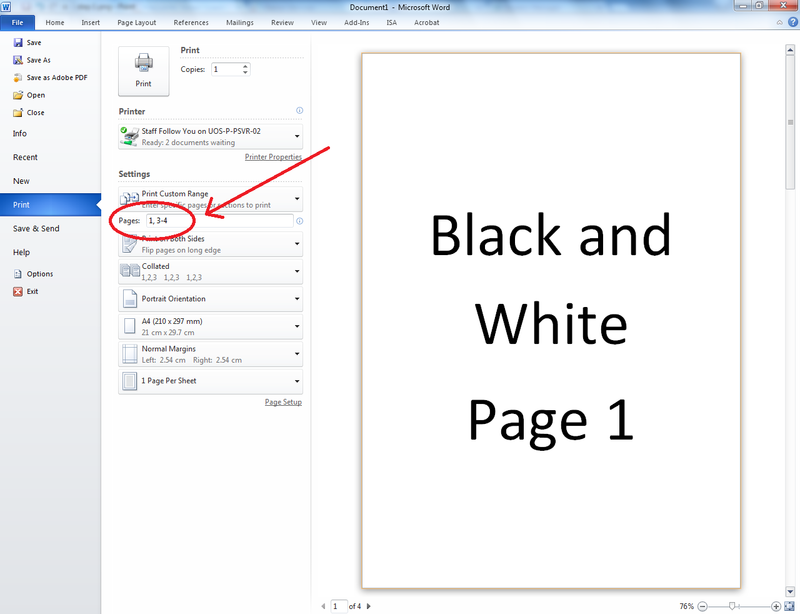 Using the same method as step two, enter the number of the pages you wish to be printed in black and white. Click 'Printer Properties', which will load a new window. Click on the drop down box that says 'Colour/Black and White' and change this to 'Colour'. Click OK and then continue printing as normal. When both print orders have been sent, print as normal. You can sort the printed pages back into the order you planned. 5. Do you have any advice on printing assignments? In order to cope with unexpected interruptions and delays in printing, we recommend that work is sent to a print-queue two days before the assignment's submission date. Select the File and Print Preview options to check how your document looks before printing. Our printers automatically print in black and white. If you need to print in colour remember to change this before sending the print job. When you highlight your job on the MFD, the number of pages to print will be displayed. Check that you have enough print credit to print the entire document, and top up if necessary.